Now that Gorgeous Man is back from his visit to the USA and Canada I have my camera back, and can show you some of the things that I’ve been working on. This was what he brought home. 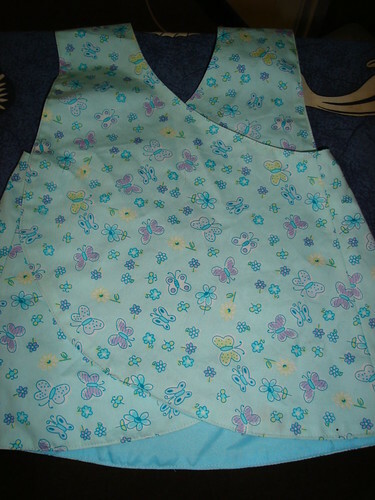 My friend F taught me how to shirr fabric. This was the result. Gorgeous Girl has developed some sign language to go with her words. 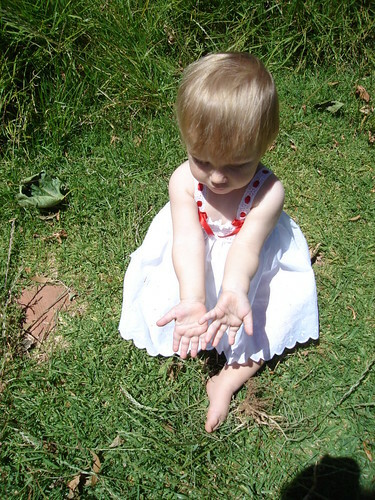 When she wants something, or wants to be picked up she turns her palms upwards and flicks her fingers in and out. I caught her mid-action in this picture. We get our lawn cut by the campus gardening team. I’ve been waiting for over 3 weeks now. The grass on the front ‘lawn’ is now taller than my head… The blue you can see in the long grass behind Gorgeous Girl is one of the two roof tiles that blew off last week! It was much windier than usual. One other thing has been occupying my time. One of the ladies in my new sewing group (which totally rocks by the way – we had so much fun) is a spinner – she used to own a yarn store, and sell wheels. To say I was excited when I learnt this is an understatement. She brought the spindle and fleece along to our last sewing day and after we had worked on our group charity quilt – we spend an hour on that and then work on our own projects, she taught me to spin. I’ve filled the spindle 4 times since then 🙂 I’m starting to get some nice thin, even sections. 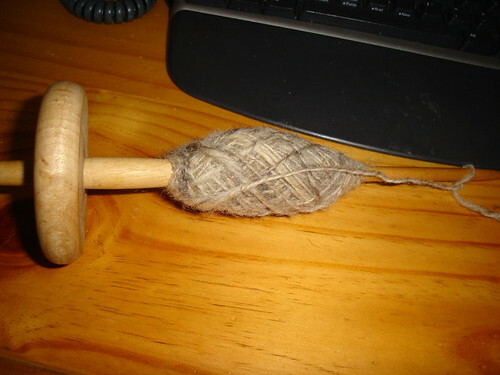 I’ve wanted to learn to spin ever since I was a little girl who had to be forcibly dragged away from the spinning demonstrators at an agricultural show, so I nearly passed out when Z told me she’d brought the spindle and fleece for me to try. I was completely overwhelmed at the end of our sewing group when she told me that the spindle was mine to keep. I have the nicest friends, honestly I do. I’m finding the spindle is great for those 3 or 4 minute chunks of time waiting for the kettle to boil and stuff like that. The snake in the grass top is finished. 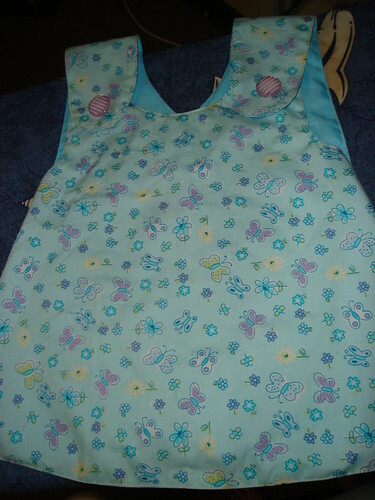 I think I’m going to send it out to be quilted. Time to start the next quilt. Fish this time. I’ve kind of let my days of the week organisation of projects slip, I think I need to get back to that. I seem to be more productive that way. * The scarves can be any pattern or yarn that you like as long as the colours are navy blue or bottle green. * You can see examples of the colours of the uniforms on this page here: Feeding Children in Africa: Wishlist. I don’t know about you, but seeing “Food” on a wish-list for a school brings a lump to my throat. * I’m going to be doing a mistake rib scarf to start with. * The scarves are going to primary aged children, so they don’t have to be overly long. * Let me know when you are ready to post and I’ll send you my address. I’ll collect the scarves and then take them in to Bronwyn at the office. There are other things going on, but I want to keep the scarves information in a dedicated post of its own. Yesterday I went to the guild meeting for November (yes, I’m a sucker for punishment) and confirmed for myself that it will well and truly be the last time I attend there. Among other things, Gorgeous Girl was the recipient of several pointedly hostile glances for saying “yummm yummm” and “ahh” while eating her food and looking at a book while the speakers were talking. Not everyone, some folk were lovely, but it just made me feel sad. So sad in fact that I started crying when I was telling The Chocolate Cat about it later. Last year they managed to help one school (it gets cold in parts of Africa in winter, it even snows in parts) 12 of them knitted 56 scarves. My colleague knitted 18! I figure I can knit a few scarves, any one want to help me? They need 56 navy blue and 54 bottle green ones – the scarves then match the school uniform and can be worn at school in the classroom. So after talking with her, I felt a lot less sorry for myself. I’m going to be knitting some scarves, just as soon as I can get to a yarn store, I’d love for you to join me – we could have a scarf along. Let me know if you are interested. Then Sarah of Nibbling Along gave me this lovely prize. 1. The winner can put the logo on their website/blog. 3. Nominate at least five other websites/blogs. 4. Provide links to the nominated websites/blogs. 5. 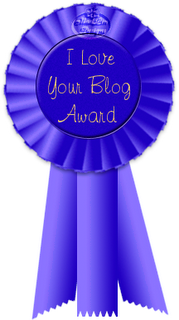 Leave a message at each blog/website telling them they’ve been given the award. 1. She has the Logic of a Puggle – This is an Australian blog, and while she lives in a different part of Australia to where I am from, her pictures often remind me of home. Btw, puggle is a real word, you’ll have to visit to see what it means. 2. Life’s a Quilt – Hedgehog is an incredible quilter, I really envy her style, who has recently taken the first steps down the slippery slope of the knitting obsessed fraternity 🙂 She also gets to travel to very cool places and I enjoy her travel pics very much. 3. Through the Loops – The most amazing knitting designs (I have quite a number sitting on my to do list waiting for the perfect yarn) and beautiful photography. 4. Javajem Knits – I don’t think there’s anything Javajem can’t do, she knits, spins, quilts, sews, and draws the most amazingly whimiscal pictures. Plus she’s just a really nice person and I feel privileged to call her my friend. And to think we’d never have met if it hadn’t been for the magic of the ‘innernets’ – Thanks Al Gore! 5. 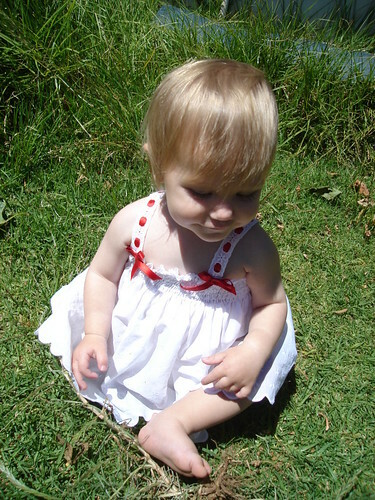 Patchywork of Mini Grey – Another Aussie blogger. I’m in love with her paper piecing at the moment. Very different from traditional paper piecing, but so effective. 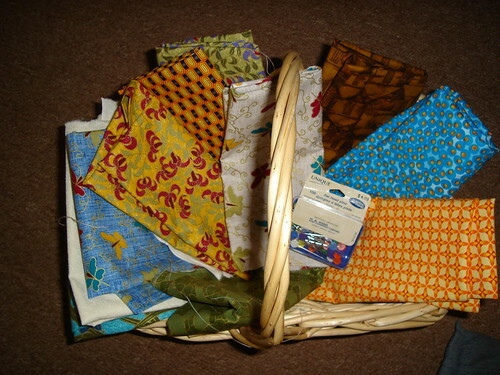 I’m planning on showing her website to my new quilting group at our meeting on Monday. It’s November and I’m sleeping with a handmade quilt and a thick blanket on top of that still. 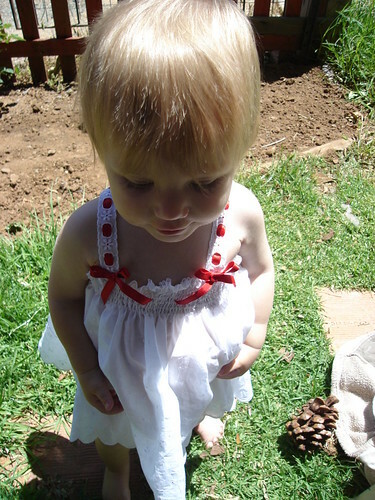 Anyway, Gorgeous Girl is asleep – we had a rough night due to some tummy issues so I’m going to hit my sewing machine. Let me know if you are interested in the scarves.